Benefitslearn to speak with flow & rythmn. Eliminate native tongue influence. Speak with authority & vocal presence. Accent softening. Speak with greater clarity & confidence. Improve the power & potential of your voice. In this hi-tech world keep pace and be a hi-tech communicator. Rid yourself of nasality, too high pitch, slurring, wrong articulation and bad diction. You can improve your voice, speak correctly, enunciate, project it properly with the right modulation. At the end of the session you will have a self created audio tape and you can ‘Hear the Difference’! Voice and Accent is an extended branch of English language learning which particularly related to English as Second Language (ESL) The prime objective of VnA is to help proficient speakers of English to make fluent with North American or British Accent. 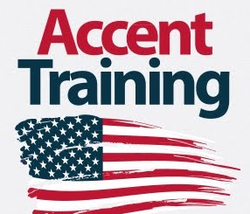 ACCENT TRAINING COURSE deals with the Proper Pronounciation , Clarity of Speeach & Intonation of Every Word . The Course emphasizes on Neutralization of MTI ( Mother Tongue Influence) while speaking Englishin order to enable others to understand you clearly. We train for American and British accents. A good speaker needs to have a command over accent and cadence while delivering his/her speeches. At British Lingua, this one-month course focuses on pronunciation characteristics of English language. It is needed all the more in Indian context and accordingly, we prepare them as natural speakers. Workshop Objectives: This two day workshop is based on the facilitators’ several years of experience and research in training. It includes sharing of concepts and experiences, demo-presentations, activities for strengthening the concepts and discussions by participants to demonstrate the learning.